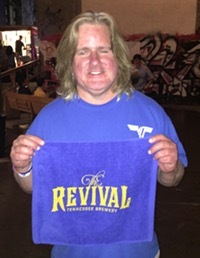 Yesterday about 10:45 AM, I wrote that I had seen an RIP tweet about a local Memphis professional wrestler, but I couldn’t find other sources to confirm it and I hoped it was a hoax. Unfortunately it turned out to be true. Brian Lawler, who went by the stage name Brian Christopher, was awaiting trial on a DUI charge in a jail about an hour east of Memphis. Sunday morning he was found barely alive, having hanged himself in his cell. At the time I blogged yesterday, he was still alive on life support, although some sources said he was being kept on life support so his father Jerry Lawler would have time to get to the hospital to kiss Brian goodbye. I’m going to come back at the end of this post and write more about Brian, but I want to get on to the news first. My condolences to Brian’s family and to any readers I have who knew him personally. The Daily Beast has an absolutely fascinating read on how the McDonald’s Monopoly game was rigged by an ex-cop with the help of the Colombo crime family. The article is a bit long but it is a great piece of investigative journalism. My friend, career coach Angie Copeland NAILED IT on her weekly blog post/email about open offices. For my readers who are into disc golf, the Flying Saucer will celebrate the release of the Saucer disc this Wednesday from 7 to 11 PM. The disc is a Discraft Pro-D Hawk 160g. Quantities are said to be very limited, so I would recommend getting there a little before 7 and telling your bartender or server you would like to order one as soon as they are released. 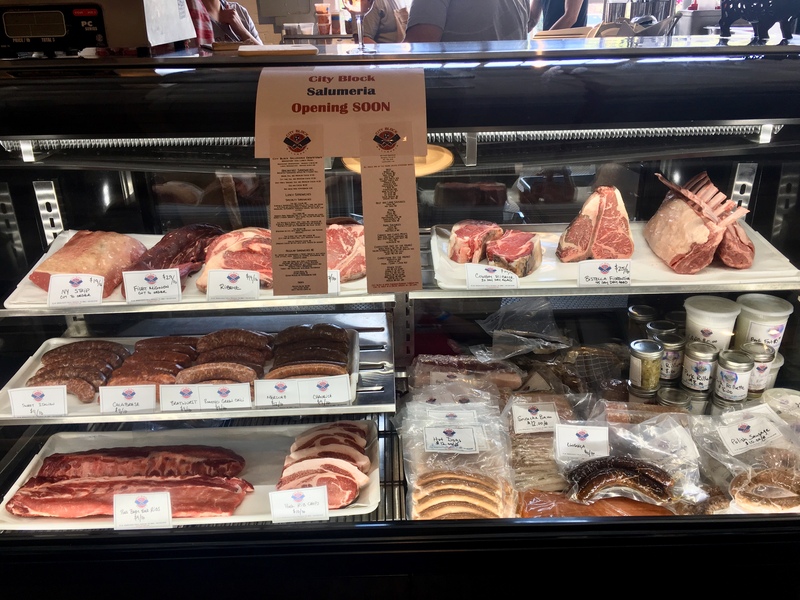 City Block Butcher and Deli is now open in the 409 South Main food hall. I snapped this photo of their case when I was in there for the Butcher Board Festival. As I strolled down Main Street yesterday, I saw the Boll Weevils. They are part of the Carnival scene here in Memphis, best known for their green masks, green outfits, and their green bus. They were handing out food and care packages to the homeless. Good guys. For dinner I tried something different: the Cali Style hot dog at Max’s Sports Bar. 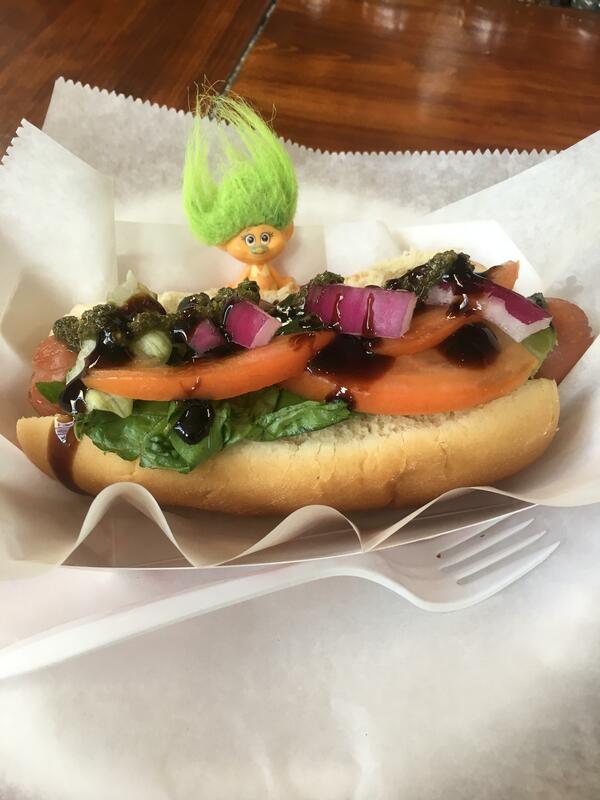 It comes with basil pesto, balsamic glaze, lettuce, tomato, and onion. For $4.75 this is an inexpensive and tasty snack. 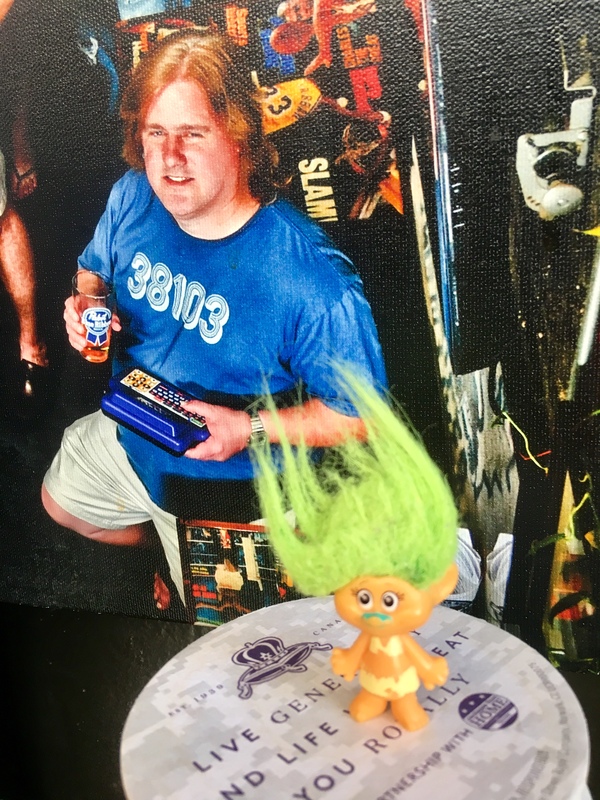 My troll wanted her picture taken with my picture from the 2012 Max’s group photo. The inaugural Bluff City Jazz Fest will be held at the Cannon Center at 5 PM on Labor Day. Najee, Leela James, Pieces of a Dream, Alex Bugnon, Miki Howard, and the PC Band will perform. Back to Brian Christopher… Brian was an outstanding heel for several years of his time in Memphis. He had that maniacal laugh, that in-your-face personality that made fans just want to see him get smacked. If he’d been born about 10-12 years earlier, I think he could have enjoyed great success as a heel in the old territory system, moving from territory to territory every 1 to 2 years. Imagine him paired with Paul E. Dangerously (Paul Heyman) as a manager, Heyman also having an over-the-top personality. Or pair him with a manager who was all business like Skandor Akbar to highlight the personality contrast. He would have been money. However, Memphis was one of very few regional territories left when Brian came of age in the early 1990s. Brian’s biggest run in WWE came as a face (good guy) teaming with Scotty 2 Hotty. That run came to an end in 2002, when Brian was only 30. Although the team was brought back for some comedy/enhancement type stuff later on, it seemed like Brian spent the rest of his life trying to recapture the magic he had in his 20s. Vince McMahon in that day and age just wouldn’t see someone Brian’s size as anything more than a midcard tag team wrestler. Of course, Brian could always go back home, but by the early ’00s the Memphis territory was not nearly as hot and lucrative as it used to be. I’m sure Brian had trouble accepting that he peaked so early in a business where many wrestlers don’t hit their prime until 40. Oddly enough, promoter Jerry Jarrett was a guest on Cerrito Live this past Saturday and wrestlers dealing with their inner demons was a topic. Brian was mentioned. Also sad to hear of the passing of Nikolai Volkoff yesterday. Volkoff a “Russian” who was one half of a great heel team of the 1980s, an anti-American team with the Iron Sheik. Despite his persona he was known as a kind and gentle man backstage. That’s it for today’s news. Back tomorrow.